For a couple years now the UE Boom has been the Bluetooth speaker I recommend to people. With the UE Boom 2, it gets better, and even harder to argue with in an increasingly crowded field of competitors. The UE Boom 2 retains much of what made the original so great. For $200 you get a rugged, portable wireless speaker. Its twin-speaker design easily fills any reasonably sized room, and it sounds great for something so small. The UE Boom 2’s biggest new development is a fully waterproof design, which it shares with the two other UE Bluetooth speakers that dropped since the Boom’s original release: The Megaboom and the Roll. The Megaboom is a $300 beast that looks like a comically air-inflated version of its little sibling, while the more portable Roll speaker is a $100 dessert plate-sized flying saucer. As with the Megaboom and Roll, the UE Boom 2’s IPX7 waterproof rating means you can leave it submerged in a one-meter pool for 30 minutes and it’ll still work. (I dunked it in a few inches of water for a few minutes and it played just fine afterwards.) The new Boom’s also tough enough to be dropped, and carries in a backpack just as comfortably as a full water bottle. The line’s getting some entirely new features with the Boom refresh too. Most notably, the Boom 2 gets some external controls in the form of tap gestures. When the Boom 2’s on, hold it in your hand and give it a slap on top and it’ll start playing. Slap it twice, and it’ll skip to the next track. A single slap while it’s playing shuts the sound off. Why do you have to hold it in your hand? It’s a clever trick. The Boom 2’s gestures only work when an accelerometer inside detects that the device isn’t sitting still, so you avoid accidentally triggering playback controls. The gestures are an effort to give users more control from the hardware itself, without messing with the beautifully simple interface and aesthetic design that made the original Boom a hit. As before, the Boom 2 has an optional app that lets you pair it with other UE speakers you might own. The speaker pairs with just about any device, say your phone, using only the phone’s Bluetooth settings. But if you want to use features like gestures or the alarm clock, you’ll need to install the app, which is available for both iOS and Android. Despite its familiar design, you’ll notice a few cosmetic changes on the Boom 2. There are now little rubber flaps that cover the USB charging port and the 1/8-inch input. Don’t be fooled, the ports are waterproof on their own. The flaps are there to keep sand and other particles out, the company told me. The stitching on the exterior fabric is also tighter now, enabling the company—UE, Ultimate Ears, is owned by gadget goliath Logitech—to print higher-resolution designs on the speaker down the line. The UE Boom 2 (right) is cloaked in fabric with a tighter weave. The good news is that the super excellent Bluetooth speaker I would have recommended yesterday is better today at the same price. Still, for less money there are options that might suit you better. I find the UE Roll lovely for carrying around the house if I’m just using it for better sound while watching internet videos. The Boombotix Pro is loud, tough, and portable for $100. And Sol Republic’s Punk is tiny, light, and while not entirely imperfect, costs just $60. Want to spend more money? There are a ton of options, but the point here is that UE nails value for the cash. You’ll feel like you robbed somebody. I’ve only toyed with the new UE Boom 2 a bit, so I’m not 100 percent sure that its real-world performance is as solid as its progenitor’s. (I should note that some people reported connectivity problems with the original model. I never had more than the occasional Bluetooth SNAFU—par for the course.) You just never know where problems might arise with more thorough testing. 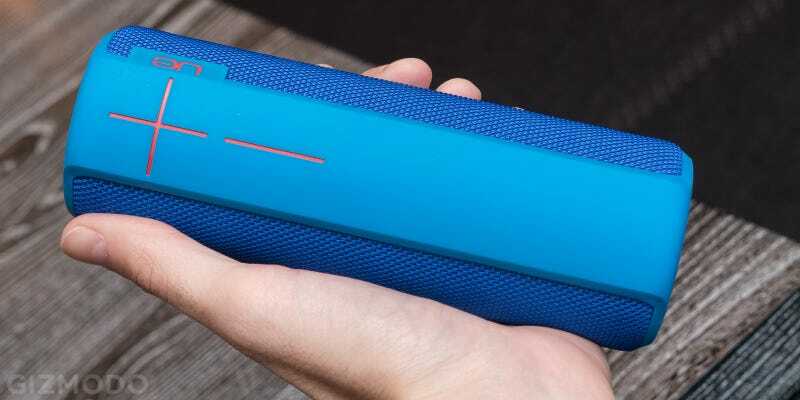 But from the looks of it, the UE Boom 2 is the all-around Bluetooth speaker to beat.